Shafurdin Habib loves the Malaysian scenery – whether it is the countryside or historical buildings. He is one of the specialists that holds a high respect for the Malaysian wide open, and this is regularly the subject of his artistic creations. Splendidly done with only the use of watercolour, this painting of old buildings is gorgeous on its own due to his exemplary hand, the clever play of light and shadow, as well as the balance between subject and space, this piece really is truly unique and stunning. It may seem like one of those sceneries that no one will pay attention to, but due to Shafurdin’s picturesque rendition of it, one may start to appreciate the beauty in the simplest of things. 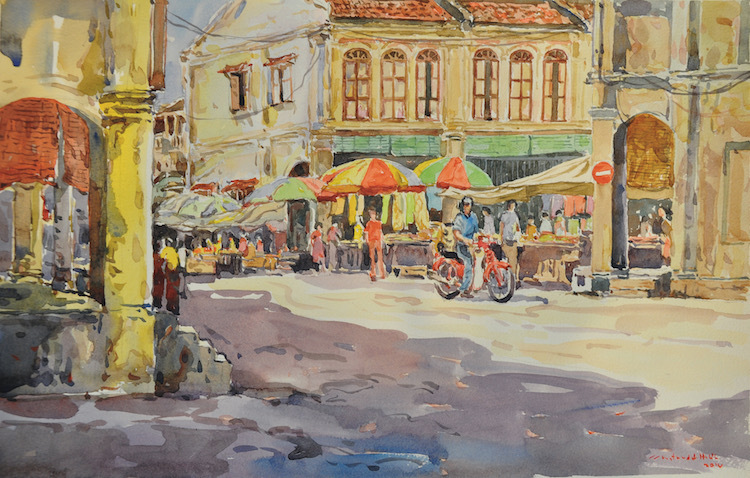 Many of his influences are derived from Khalil Ibrahim, whom he befriended after he moved to Kuala Lumpur to pursue art.